Over the years the professional leagues have come to separate themselves on styles of play within the league. England has been known for it's fast style of play with a more direct approach to football. Foreign players have come to play in the English league to ply their trade and dazzle the crowds. Players like George Best, Eric Cantona, Henry, Christiano Ronaldo, Matta, Silva, Tevez, Aguero to name a few. We now look at " La Liga" a league who is dazzling us with entertainment, team chemistry, flowing style of play, tactical and technical brilliance week after week. La Liga is a league who's domestic players for the most part are the stars of league and country, this has been proven by the success of their national teams. The aim of this 1v1 emphasis is to create an atmosphere and environment in training where our talented players can find their dribbling feet, become more comfortable on the ball and express themselves. An environment where they're encouraged to be creative, problem solve and challenge themselves without fear of derision or ridicule. The overall idea is to create more 1 vs. 1 situations and facilitate the increase of game related contact time with the ball. These games is not the definitive piece of work, the games in here have been put together by many experts such as Horst Wein and Youth Academies that have had the opportunity of watching what kids enjoy and the reaction in their performance and attitude. You should hopefully find this a underline and helpful start to your vision in creating sessions that will help build confidence to players and create a challenging and learning experience. You are encouraged to pick and chose your own conditions or practices. The emphasis here is on the promotion of player centered experimentation and expression, let them play and problem solve; encourage and reward creativity. One player, one ball, the ball is his/hers and does not want to be shared. Ignore coaching team aspects of play and allow players to begin to master the ball. Games that use imagination and fantasy should be used as tools to motivate young players. 4v4, small goals, no keepers (or last player back, keeper on the fly). There should be no ‘set’ position, free play is encouraged. Heading is not allowed at this age. Allow players to hop, jump, skip, tumble, roll, fall during play. Practice should include ‘free’ play and time for players to try new and creative things with the ball. 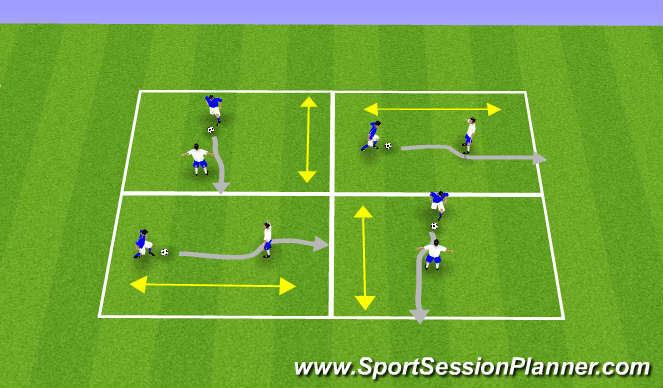 - In pairs, one player with the ball, Player with the ball must dribble around the grid attempting to kick the ball into the legs of teammate. Teammate must attempt to dodge the ball by using quick feet. Area as shown in diagram, use as many as required. - Player on the ball must dribble around the grid while keeping the ball away from opponent. - Defending player is trying ti steal/dispossess the attacker of the ball. If the ball goes out of play ball goes to the player it would correspond to as per regular rules of the game. If defender is successful in stealing the ball s/he gets a point. - 3 attempts each then again rotate. - To start a player serves a pass into opponent and play becomes live, the player who passed the bal becomes the defender with the idea of stopping the attacker from scoring (dribbling past the line). - Defender attempting to steal and dispossess the attacker of the ball, if successful this player can attack the opposite goal. If ball goes out of play the player who is to get possession plays a pass into the defender who serves back and play continues. - 3 attempts each then rotate attacker to defender. - Extra point for "nutmegs"reward skill and creativity. 1st touch out of feet, feints, dummies- try something new. - 1 point for corner goals (left or right) 3 points for goal behind the defenders starting position. -3 attempts each then rotate attacker to defender. As before with the exception that the player attacking can now beat their player and score by knocking over the cone behind the defender by passing the ball and knocking over the cone. - Identify the space you want to attack (Identify best option? - Things player must identify, what is the best option? why? - Player must keep the ball up between themselves in pairs. They must have 2 touches whilst keeping the ball in the grid. - Encourage competition - last not to let the ball drop most keep ups. 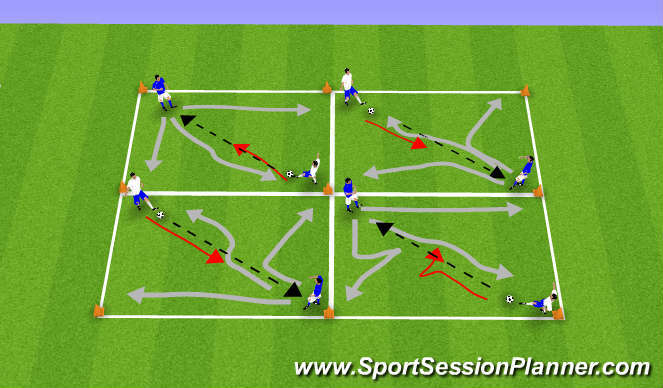 - On call blue player rotate clockwise while white must keep the ball up with 2 touches. - Maradona 7 aka Pele 7- toe, toe, knee, knee, shoulder, shoulder, head to feet.